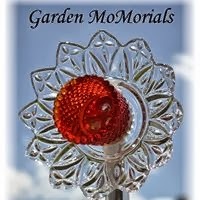 Garden MoMorials is a company creating beautiful garden art from re-purposed glass and metal found in yard sales, thrift stores, and vintage shops. This shop was named in honor of a young girl we lost to cancer, Maureen (MoMo). These were our gifts to her in her memorial garden, and we named our shop in her honor. And now we want you to enjoy your own garden all year round with our beautiful clear and colored glass flowers and other garden art. We use different colors, textures, and shapes of glass to create beautiful flowers, bird baths, bird feeders, wind chimes and garden art. We use vintage glass pieces to create these works of art that can be added to your garden or as a special piece to bring the beautiful outdoors into your home all year long. *We donate a portion of the proceeds from our company to front-line cancer research.